Sarcasm is the lowest form of wit, there is no art to it. Oftentimes it is meant to be funny, it relies on putting another person down and as a result will often make those people look or feel small. What exactly is sarcasm & why does it hurt? Sarcasm is when someone says something that everyone knows is untrue in order to draw attention to its ridiculousness. Everyone probably knows at least one person who loves sarcastic, passive aggressive, barbed modes of communication. They love to ‘tease’ and think sarcasm is well-meaning. However, I would like to draw attention to the fact that sarcasm is really just thinly veiled meanness. When it is used aggressively, it can consist of mimicking one in a unpleasant manner. It can be used in a way for that person to try and improve their own standing and reputation by putting you down. Such people tend to have low self esteem and so require the use of put downs such as sarcasm in order to try and make themselves feel or look better. If someone who cares about me is “acting out” with sarcasm and is being purposely hurtful, I try to ask myself why I think this is happening? What are they feeling insecure about? How can I help them get through this feeling of insecurity? For someone who is angry or upset, but us too afraid to bring it up, they will often use sarcasm as a disguise. It’s a form of passive aggression or a way that they can assert their dominance. What do they need? Sometimes people are just not good at reading those around them! 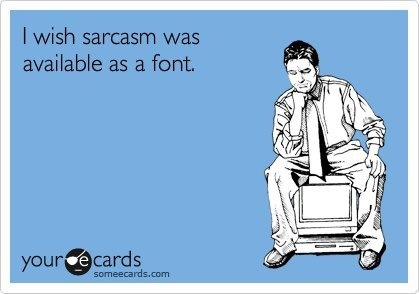 This use of sarcasm tends to be more playful, using the tactic to lighten to mood or bond. Used as a coping mechanism, it can lead to malicious sarcasm. Sarcasm is not only hurtful, but is it the least genuine mode of communication. Let’s get it out of our relationships. Tell me how you’re really feeling. I am a sarcastic soul myself but I really try to point my arrows only at those that I know get it and would not be offended by it. Sure, I agree it borders on teasing but if the other person can have a good laugh about it as well, it’s really fun! And I disagree that it’s the lowest form of wit. I think what you’re talking about is more like bullying where one’s weaknesses are sought out and made public in some ridiculous metaphor for everyone to laugh at. That’s no fun and deserves no applaus at all. I don’t like hurting people but I absolutely love battling out a sarcasm sword fight with someone with the same sense of humor and intellect. Next PostWhat is Yoga and Why do I practice Yoga?